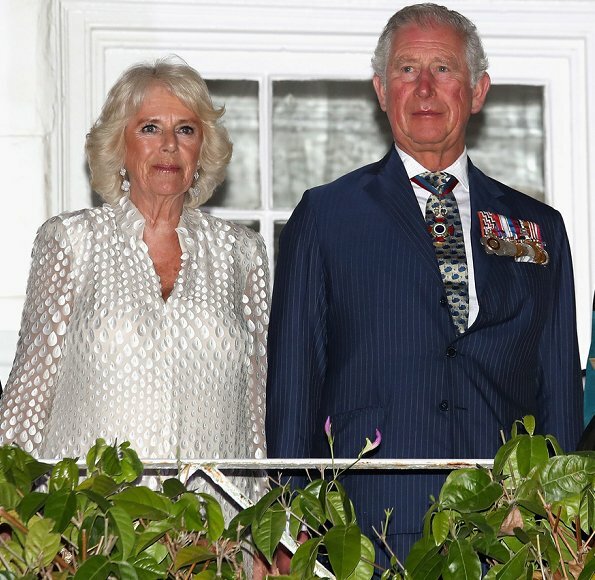 On the evening of the first day of their visit to Barbados, The Duke and Duchess of Cornwall attended a reception at the Prime Minister's residence in Bridgetown, Barbados on March 19, 2019. 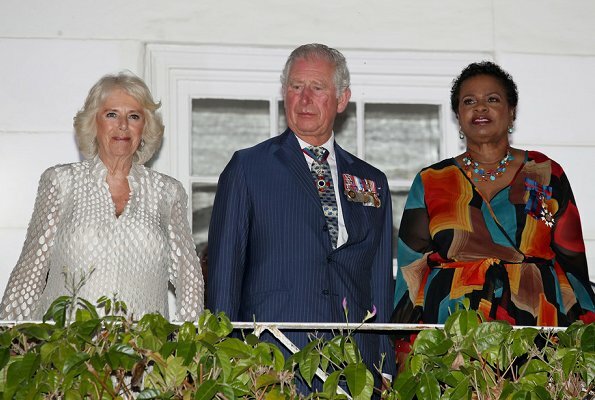 The Duke and Duchess of Cornwall are currently visiting a number of countries as part of their Caribbean Tour. The detailing on the top is amazing. She looks great. Agree. And the white colour suits her very well. Oh, there was no good coat! It looks like it is made of bubble wrap and it fits poorly. 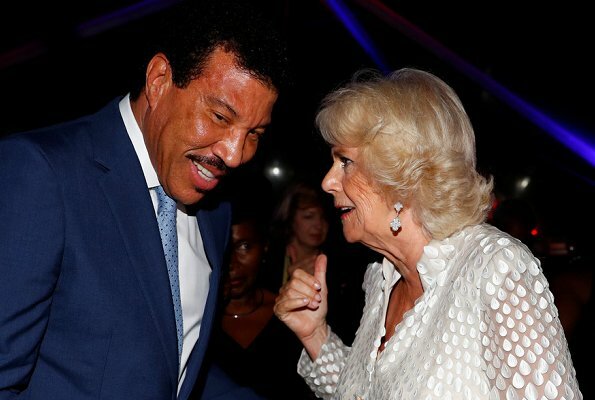 And Richie's young girlfriend looks like she's on her way to the altar. 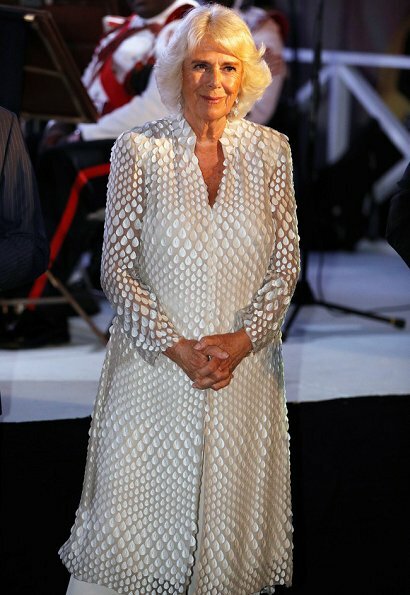 Other than the slightly off-putting feeling that the fabric of the tunic looks like reptilian scales, it's a lovely outfit and she wears it well. 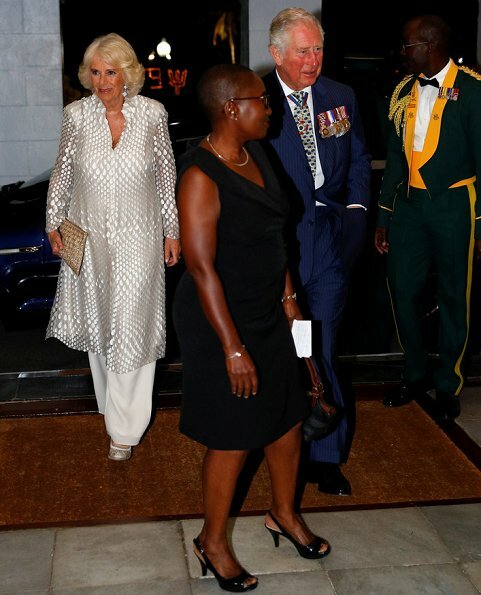 Camilla always wears these cooling light tunics and flared pants in hot, humid weather and they suit her very well. I'm expecting to see more of them in pastel colours during the remainder of their Caribbean trip. De enige van de nieuwe lichting die het echt heeft begrepen. :-) I thought this outfit was lovely until I read the comments from Elin and Anon 11.21 which just made me laugh. 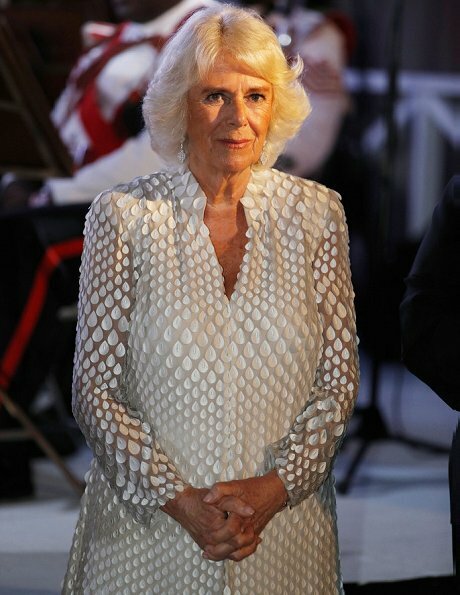 I still think it's smart and really suits the Duchess but scales and bubble wrap have taken the edge off a little. I miss the emoji's, would've love to post some laughing emo's for Elin and Anonymous! Think it's hilarious! Thanks ladies for your sense of humor! 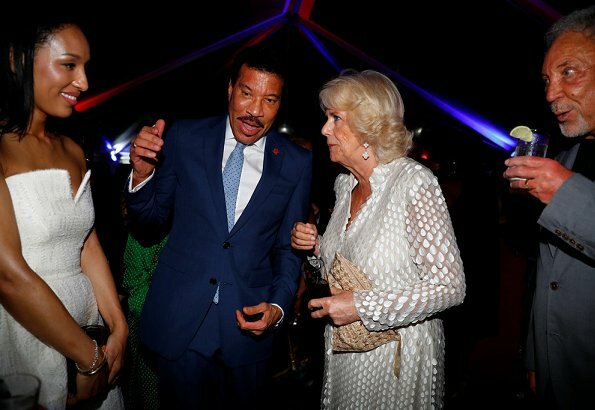 I love Camilla’s outfit. That too is beautiful. I’ve heard that they’re including Cuba in this trip throughout the Caribbean. I pray it isn’t true. It would be shameful for them to visit a country that has been enslaved, and has not had free elections in 60 years. What a strong opinion. But I want to remind you that western states are in dialogue with some countries that have a different political system or do not share our understanding of the rule of law and democracy. Right, because they only ever visit countries with a history of democracy and good governance. Camille has found her style. This is probably one of the worst outfits I've seen in a long time, I used to have a shower curtain back in the day that looked just like this top. I like the tunic idea and the palazzo pants for women of certain age, they are very forgiving, if only the fabric had been different. 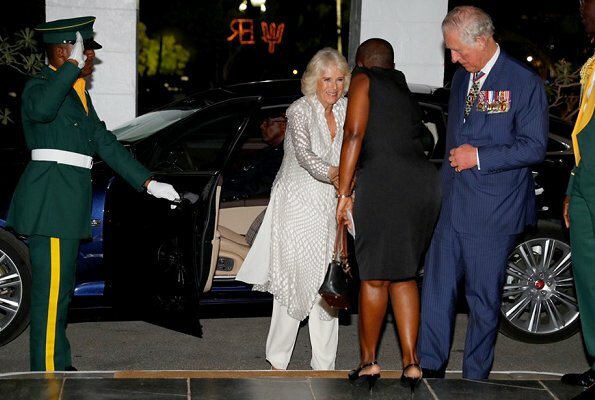 I'm also a fan of these cool tunic and trousers outfits that Camilla favours on these tours. I love the light colours. I agree the texture here is a bit "scaly". 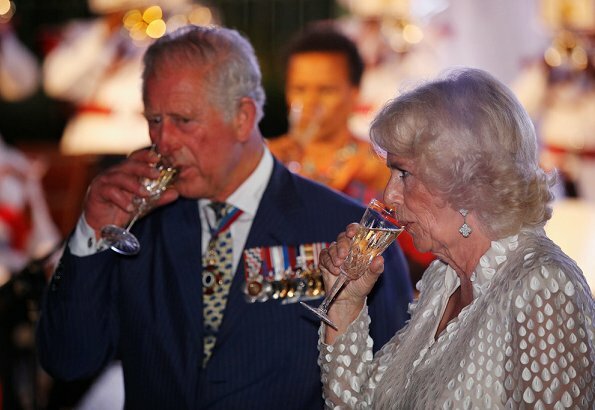 Camilla heeft stijl, altijd mooi gekleed, mooi koppel, horen bij elkaar. Is there someone close to her who can advise her on purchasing better brassieres? It would be very beneficial to her “look”. Lovely as ever. This is a long tour. 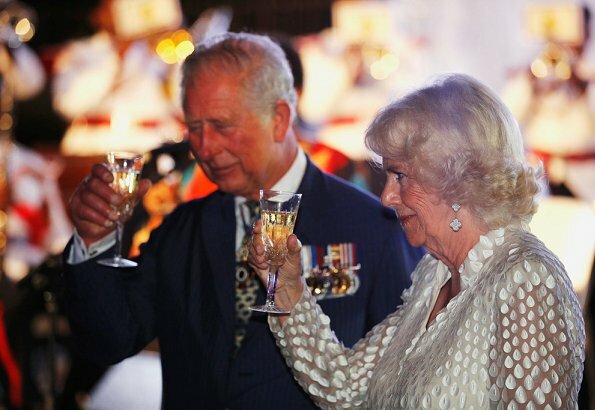 Camilla wores the tunic very well. In the last pics they look really tired. 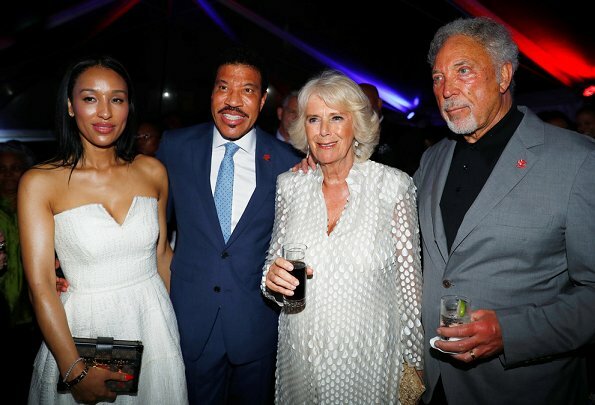 First picture: Where are Prince Charles' eyes? Is he admiring the back side of the black dress?